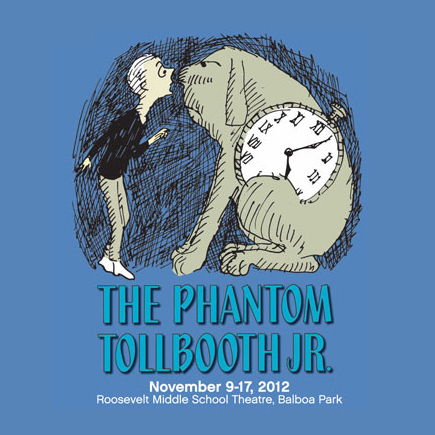 Norton Juster’s beloved children’s book, The Phantom Tollbooth, is adapted for the stage in this modern tale of a boy who must save the princesses Rhyme and Reason and reunite the brother Kings who rule over the cities of Dictionopolis and Digitopolis. Aided by a trusty time-keeping dog, Tock, Milo successfully brings harmony to the Land of Wisdom, finding that everything we learn has a purpose and whatever we do affects everything and everyone. There is never a reason to be bored in a world full of so many things to discover! A JT Premiere! Recommended for all ages. Book by Norton Juster and Sheldon Harnick. Music by Arnold Black. Lyrics by Shedon Harnick. Based on the book by Norton Juster. Presented through special arrangement Music Theatre International (MTI). All authorized performance materials are also supplied by MTI, 421 West 54th Street, New York, NY 10019. Phone 212-541-4684. Fax 212-541-397-4684. www.MTIShows.com. Production sponsored in part by Roosevelt Middle School International Baccalaureate Magnet, the City of San Diego Commission for Arts and Culture, the City of San Diego Park and Recreation Department, and the County of San Diego.